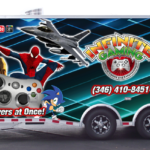 The Infinite Gaming mobile game theater is amazing! 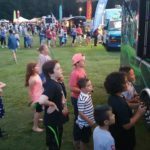 Our luxury, 32-foot video game truck is a virtual party on wheels…that comes right to you! 7 HUGE TV’s and the best consoles and games! 28 can play at once in our climate-controlled, self-powered gaming wonderland! Book your Infinite Gaming party today!